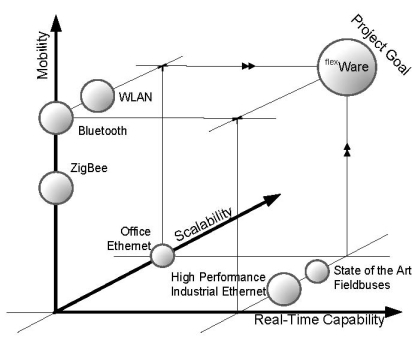 The project Flexible Wireless Automation in Real-Time Environments ( flexWARE ) aims to implement a novel platform, which will have a real-time communication based on different wireless technologies. This novel secure middleware between the physical communication and the application will be designed with special respect to security, flexibility and mobile, real-time enabled nodes that can roam between the Access Points of the system. This and the conjunction with localization services will enable the dynamically reconfigurable factory of the future, seizing new market opportunities with revolutionary new possibilities for applications. The interfaces to the applications will be open, allowing third party development in a secure and predictable factory automation network. The outcome of the project will open possibilities for more efficient production processes and plants due to its flexibility and scalability. Moreover it is likely that this proposed project will influence science as well as the market due to the savings for (re-)cabling and maintenance as well as new opportunities as factory wide maps of goods.